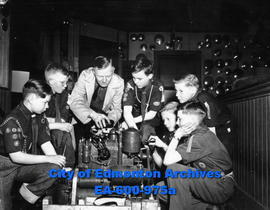 28th Edmonton Boy Scout Troop given motor instruction by master mechanic Harvey Holte. (L-R) Ken Seebrasse, Edwin Taylor, Harvey Holte, Don Walker, Don Holte, Warren Holte and Brian Eldred. 28th annual meeting of the Provincial chapter of the IODE: (L-R) Mrs. R. Bewley, Mrs. P. P. Griffith (new president), Mrs. R.H. Coles and Mrs. W. Stanley Ross. 28th annual meeting of the Provincial chapter of the IODE: (R-L) Mrs. R. C. Marshall, provincial president, hands over the gavel to her successor, Mrs. P. P. Griffith. Marshall, Mrs. R. C.Griffith, Mrs. P. P.
31st annual bonspiel of the Alberta Curling Association at the Edmonton Curling Club. 31st annual bonspiel of the Alberta Curling Association at the Edmonton Curling Club: Mayor Harry Ainlay throws the first rock to begin the tournament. 31st annual bonspiel of the Alberta Curling Association, headquarters at the Macdonald Hotel: (L-R) Gordon Forrester, Bruce Hamilton and Dave Clayton. 31st annual bonspiel of the Alberta Curling Association, headquarters at the Macdonald Hotel: W. G. Sue. 39th annual convention of the Alberta Association of Municipal Districts at the Macdonald Hotel. The executive: (L-R, T-B) J. Smith, A. B. Haarstad, E. Cammaert, David Roberts, J. M. Wheatley and C. P. Hayes. 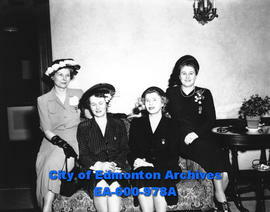 Macdonald HotelSmith, J.Haarstad, A. B.Cammaert, E.Roberts, DavidWheatley, J. M.Hayes, C. P.
49th Battalion, Loyal Edmonton Regiment Association reunion dinner at the Macdonald Hotel.